When we think of rugs the first thing that comes into our minds is that great feeling of warmth that tickles when we walk bare feet and drag our feet through a great textured carpet. Carpets are used to cover floors either for protecting the floor or for making sure the person living in that particular house is warm enough on their feet. So I can say carpets and rugs are really useful part of Home Furnishing, especially as they add a plus of personality to the overall design of the room. Carpets give a lovely sensation when you walk over them, especially barefoot, and also offer interesting aesthetic possibilities. They are seamless and therefore unify spaces, but also can be used to mark off zones, or areas of activity. They permit versatile solutions for our interior design due to the colors, textures, and finishes they come in. Another quality of carpets is the acoustic and thermal insulation they provide. They are suitable for all the rooms in the house, except in the bathroom and kitchen unless you are prepared to make the extra effort to ensure they do not get wet or stained when bathing or cooking. Since eternal time, rugs and carpets have been a vital part of every home. Using them to decorate the house adds unique style, warmth and color to the interiors. They are available in a wide variety of colors, styles and designs, with all of them featuring a special functionality. Besides using it as a floor covering, you may also use rugs and carpets as wall hangings. 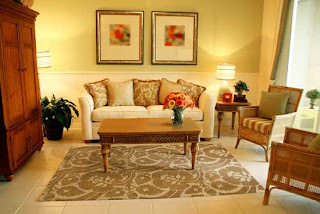 When it comes to different types of rugs and carpets, the list is simply overwhelming. Varied sorts of techniques are employed in distinct regions of the world to manufacture distinct pieces. Some of the common types of rugs and carpets are Woven rugs, Needle Felt rugs, Tufted rugs, Embroidered Rugs, Braided rugs. When choosing a carpet, take into consideration its texture, pile, the yarn, weight, density, color, and design. Most carpet is made of sheep’s wool, which is durable, dyes readily, and handles easily. Do not use carpets and rugs if you have pets or if you or your family members suffer from allergies to dust: they get dirty easily. Vacuum carpets regularly so that neither dust nor dirt accumulates in them. Make sure all carpets used on the floor are designed for floor use: some carpets are intended for wall use. Avoid spills because stains are hard to remove from carpeting. Carpets give a space a natural look and feel. your blog contain lot of information related to the carpets.for my new home i need some good carpets so plse tell me the place in ontario where i get the carpets and the cost of it.